We realize that it has certainly been a long time coming, but we finally decided to build a specific website rather than just using this blog to advertise our business. There seem to be some inherent difficulties using a blog as the main portal to a company's online image. There is no doubting that blogs definitely provide the internet with quality content, but unfortunately the internet market has not warmed to them as company websites. They definitely are warmed by the quantity and quality of the content, with many blogs enjoying superb rankings in search engines. Many blog sites, will convey the searched for messages or information and include a link to the company master website. It could be said that blogs are fueling the web (with content). 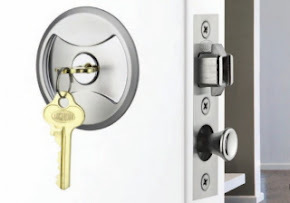 Our new site that is still in construction is www.st-louis-locksmiths.com and we invite our readers to visit and offer suggestions (here) on how you think it can be improved. Why Dont You Make Car Keys? It is perhaps one of the most common questions I get these days. For a great many years, I worked with companies that offered automotive locksmithing service works. I managed one companies busiest automotive locksmithing service department. I wore myself out making keys to vehicles, rekeying vehicles, repairing worn or damaged locking mechanisms. In the late eighties, the automobile manufacturers were forced by insurers through government lobbying to increase the security of all vehicles. Insurers were inundated with regular claims from motorists to replace their stolen vehicles. The insurance companies found this to be a huge and increasing cost to them and were preventing them from making greater profits. When Texas Instruments produced some new intelligent and inexpensive electronic components, the insurance companies jumped all over the new technology and saw it as their best chance to reduce the payouts they were having to make. The transponder industry grew from that time and this resulted in the stolen vehicle statistics dropping like a rock. The insurance companies were all of a sudden, saving billions of dollars by reducing claims for stolen vehicles. This is because it has become virtually impossible to move a vehicle equipped with modern transponder "Chip Key" technology, unless the correctly programmed "Chip Key" is recognized by the vehicles on board computer. I was talking to the fellow to whom I refer my automotive calls today. He told me that business is brisk, but he is continually pumping money into the latest machinery and diagnostic equipment, in order to be able to continue to offer the services. His latest spend is for <$10,000 for equipment especially designed to produce keys for Volkswagen, Porsche, Mercedes vehicles. These modern vehicle manufacturers, regularly change their onboard vehicle transponder technologies and service companies are consequently forced to update their equipment, to be able to provide customer services. If I wanted to be able to offer automobile keys, as a part of my locksmith business, I would be forced to spend approximately $20,000.00 just to get set up initially. That is for machinery only. I would still be required to purchase inventory of keyblanks and chips. Then there is the required diagnostic equipment necessary to program all the different makes of cars. Add to this the ongoing cost of purchasing the updates for new vehicles and the costs soar. When costs soar, this directly implies that the retail price (the price the customer has to pay for their key) increases accordingly. It is common for duplicate car keys to cost as little as $75, but the greater majority cost between $100 - $150 for each key. It is awkward and sometimes embarassing when a potential customer calls me wanting new or additional keys for their new jalopy, expecting that "every locksmith" can make keys to anything. I have worked in this industry for close to 30 years and it pains me to have to say "NO". My customers usually understand when I explain the facts to them, but I cringe because it is business that I know I am missing out on and the other business that comes from it too. When a customer calls up and asks how much to cut my car key? If I were to quote a "very high" price, just to give the impression that I do that sort of work, with the hope that the customer simply refuses to pay my prices, I believe I am doing a monumental disservice to them and to myself. Then what happens when a client calls me on it? (they are prepared to pay my price) - The egg on my face is not worth the trouble. This is Why I Do Not Make Car Keys! 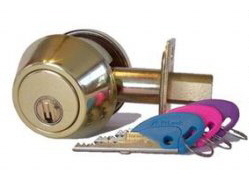 St Louis Locksmiths - Locks210.com unlock doors for stranded motorists and householders. I receive quite a few calls from stranded customers, facing being locked out of their car or house or office. Often this is due to the cleaning lady, locking the bottom knob. 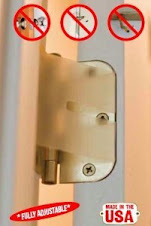 Many customers will lock their deadbolts but often not the knobset underneath. Probably because the lock is not on the same key and they dont want to carry 2 different keys for the same door. But when you might have an unfamiliar person attempt to "help" you by making sure your door is secure, this often times causes the locked out situation. You'd be surprised how often this occurs. Other times are when the turn button in the knob has accidently been partially turned. The knob is always unlocked on the inside but you do not realize that the knob is locked on the outside. That is where I come in. Like a white knight on a white steed, I arrive quickly and effortlessly open your door, saving you from the heat or cold, helping you to feel better. 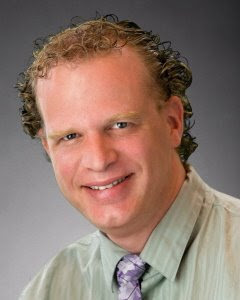 We prefer to serve our customers by appointment, however we realize that people rarely lock themselves out on purpose. We will attend to emergencies although we do not advertize as an emergency service. Over the years, I have seen many advertisements for Emergency Locksmiths and 24 Hour/7 Days service, but too often I have found that many of these companies refuse to answer the phone after 5pm. Why advertize 24 Hour Service if you are not going to do it? I have been extolling the benefits of fingerprint identification locks for a little while now, but recently I have learned by trial and error (some costly errors), that many of the more popular fingerprint scanners used in fingerprint locks have difficulty in recognizing fingerprints of people over the age of 60. This is very unfortunate and, I suggest a serious setback for mainstream acceptance of fingerprint locks for residential uses. The problem lies in the ability of the scanner to read the fingerprints. You see, as people age, the tips of our fingers wear, making accurate differentiation of prints, significantly more difficult. When attempting to program a recently installed fingerprint deadbolt, I was attempting to help an 88 year old to program her fingers into the unit. The application was for an internal cupboard with the desire to make it secure, but not have to carry a key or remember a combination, a task that many elder people find debilitating due to memory loss. You cant lose your finger* though. Unfortunately the application will require a digital deadbolt, to ensure the user can operate it. Monitored Alarm Systems are not Security Protection Devices. I regularly discuss the above statement with many customers. Usually I am asked if I sell and Install electronic alarm security systems, to which I reply that the statement is an oxymoron. An alarm system is not and can not be a security system because it does not perform or provide any protection. It can only inform that a condition exists. 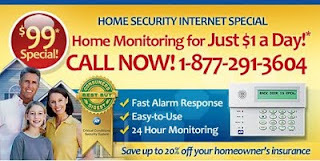 Pictured above is a typical advertisement implying that alarm systems that are monitored provide protection for homes. One of the largest companies in the world, regularly sells their products by trying to convince consumers of the competitive advantage of their monitored alarm systems. The average cost of a monitored alarm system, often ranges from $30 - $60 per month. This is the raw cost to have a manned 24 hour monitoring centre "watching" your property. What many companies, similar to the one above fail to inform the client, is the hidden costs associated with monitored alarm systems. Police or emergency service attendance is often an extra cost borne by the homeowner, that monitoring companies often fail to disclose. If your property suffers a false alarm and police attend to find no signs of forced or illegal entry, YOU WILL BE BILLED for their time and attendance. If the monitoring company detects a fire alarm at your property, usually the fire department will be informed immediately and fire trucks will be dispatched. If the alarm condition is false, YOU WILL BE BILLED anyway, for fire department attendance. If regular false alarms occur, this could become a significantly costly exercise. Many burglars know the tricks to fool alarm systems. One example is, a burglar gains entry to your automatic roller garage door, closing it behind them. Your alarm system sounds, triggering the monitoring company. Police attend within the average time of 10 minutes. Police find no sign of forced entry and are not allowed to attempt to or enter your premises without a warrant. Meanwhile, the burglar/s are waiting inside the garage for the police to leave, after determining the alarm was false. The burglar now has as much time as they need to perform their theft, free from getting caught, while the home owner suffers the loss of their property and the added financial burden of emergency services invoices. The home insurance refuses to pay on a claim, because the police report at the time declares a false alarm. The only beneficary of this whole episode, is the burglar, who made it off with your property. 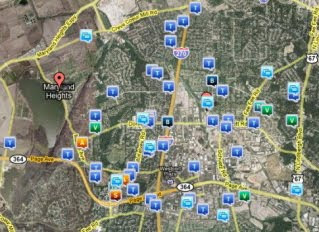 The current crime statistics for Maryland Heights area July-August 2009 are listed below. To improve your security protection call us today. Remember the old door chain we used to have on our entry doors to allow the door to open 2 inches so you can see/talk to the person knocking on your door? Assa-Abloy Asia Pacific, owners of Lockwood Australia, produce this modern take on the simple door chain. 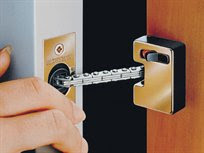 The Securichain is designed to be mortised into the door, similarly to a cylindrical deadbolt. It provides a flush, neat fit with an easy to release strike/keeper. I think this fashionable design will also work incredibly well as a child safety device, where if it is fitted higher on a door, small children, whose tendencies are to open doors regularly when adults are not looking, to run outside to play, would be unable to get out, yet the adult could easily open the door. Assa-Abloy Asia-Pacific recently released their new residential/architectural deadbolt. The 005 Paradigm, sees a shift toward more safety concious locking products. This deadbolt combines the benefits of double cylinder locking mechanisms with the primary entrance stipulation of the International Building Code, whereby all primary entrances require to be panic release mode in case of an emergency. As you can see in the picture, the inside turnbutton has a key hole and an indicator as well. This is designed to give a person inside immediate knowledge whether the lock is "deadlocked" or not. In some parts of the world, the insurance company definition of "deadlock" is "any lock that is able to be operated by a key from both sides of a door. The Paradigm cylindrical deadbolt with LockAlert status indicator, SafetyRelease and DualSelect locking is suitable for residential and architectural applications. Notorious and reknowned lock pickers Mark Tobias, Toby Bluzmanis and Matt Fiddler, have demonstrated techniques to easily defeat the supposedly un-defeatable CLIQ products being manufactured by the world leading High-Security lock manufacturing company Assa-Abloy. From Wired.com, "The hacks are low-tech and don’t involve attacking the actual electronic component of the lock. Instead, they use standard techniques for opening mechanical locks, similar to bumping — where an attacker places a specially-designed key in the keyway and “bumps” it repeatedly with a device until the lock releases." “These [locks] are used in some high-security facilities,” Tobias said. “And the makers tout the fact that this is the ultimate in security. And they shouldn’t be saying that. They’re used in government buildings, banks, and critical infrastructures, such as power and water plants and transportation facilities. The Swiss Federal Railway System uses them as does the Ottawa International Airport in Canada. The locks use what’s called CLIQ technology, developed by top Swedish lock maker Assa Abloy, and its Germany-based subsidiary Ikon. The locks were first made in 2002 by Assa Abloy, but the same core technology is now used all over the world in electronic high-security locks made by other Assa Abloy subsidiaries, such as Medeco, Mul-T-Lock and Ikon." But the researchers found that none of the technology’s ultra-high-security features — digital ID, encrypted communication, or audit log — matter." The lock makers say they can’t respond to the issues Tobias is raising until he tells them exactly how his attacks work. But before he’s willing to give them the details, Tobias has insisted the makers agree to fix the vulnerable locks retroactively with no cost to customers who have already purchased them. Something they refuse." 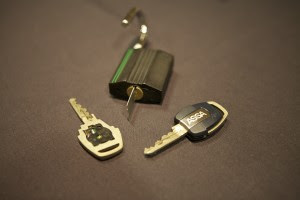 "Bluzmanis demonstrated an attack by taking an Interactive CLIQ electro-mechanical lock made by Mul-T-Lock and inserting a mechanical-only key cut to the same keyway. After inserting the key, he does something to vibrate the key for a few seconds until the mechanical motor in the cylinder turns and lifts the locking element to release the lock." “There’s no audit trail that the lock has been opened,” Tobias says, “because there are no electronics [involved]. If the attacker entered the room to steal documents or sabotage the facility, the last person who entered before him and who showed up in the audit log, would presumably get the blame." " When electro-mechanical keys are lost, administrators don’t rekey the locks, they simply reprogram the system to reject any key with that unique ID. But a thief could remove the key’s battery and convert it to a mechanical key. Without the battery, the cylinder wouldn’t know a key has been inserted; the thief could then vibrate the lock to open it." "Once the lock is opened, it will remain unlocked until a valid electro-mechanical key is inserted. Until then, even an electro-mechanical key deprogrammed to work with the lock — because an employee left the company or the key was lost or stolen — will work. Because the de-programmed key has a battery, the chip in the cylinder will log it as an “access denied” event, but the person holding the key will still be able to open the door." (source...) Special Thanks to Harry Liebman of CandyTorahs.com for pointing to this article.